There’s an air of rustic nostalgia to the Dundee Rep Ensemble’s first production of this year’s autumn season, a revival of playwright Anne Downie’s adaptation of Betsy Whyte’s 1979 memoir The Yellow on the Broom, which was first staged in 1989. Yet the themes in which it deals are raw and current. Whyte’s book recalled her own childhood as the daughter of a Scots travelling community in the 1930s, their home ground the fields and roads of rural Angus and Perthshire, from where much of the core audience of Dundee Rep is drawn. Yet although she was unique in earning a scholarship to high school in Brechin, Whyte’s family and community were still subject to mistrust and harassment – most often from the police, or ‘tobies’ as the poetic Scots traveler cant the play is delivered in has it. The parallels with the current treatment of shifting migrant and refugee communities, and the role of distant war in defining their situation, are powerfully implicit. Kenneth MacLeod’s set combines deceptive simplicity with hidden depths, much like the duties the nine-strong ensemble are asked to perform. The stage is a wooden platform surrounded by a half-horseshoe of rocky foothills, yet hidden panels and attachments reveal a campfire pit, a flowing stream and a garden clothesline. Similarly, the six non-principal cast members perform 24 roles between them, and the versatility of the Rep’s team allows a rich sense of changing place, time and even season to be evoked. 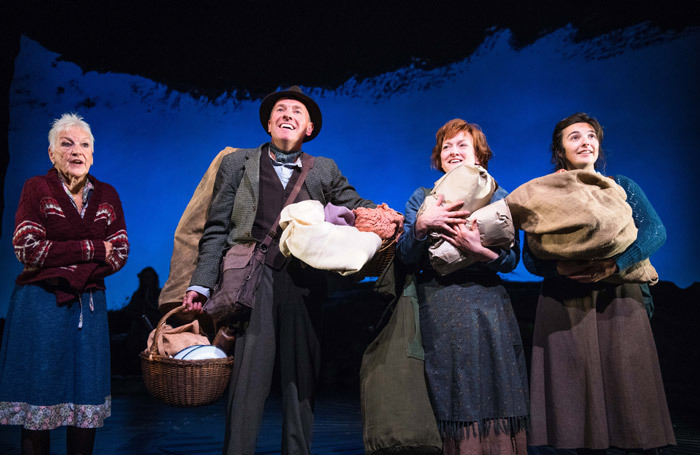 At the core of the piece, Chiara Sparkes – one of two newly-graduated performers in the cast – as young Bessie Townsley and Gary MacKay and Beth Marshall as her parents Sandy and Maggie form a close-knit trio, hardened by the changing winds’ of others’ kindness or scorn. The only partial mis-step is the role Ann Louise Ross plays as Bessie in her elder years; a commanding performer when given the stage, Ross is too good to float, quiet but present, on the fringes for much of her stage time.